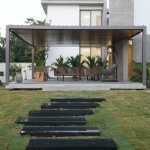 Living In and Out is a contemporary house designed by SAK Designs and is situated in a city of Ahmedabad, western India. “Owner had a plain land which he wanted to enjoy from every corner of the house. This is how the planning began for a unique family home. The client though stays in US with his family, travels often for his business to India. He wanted to have an absolutely open and barrier free planning. The front part of the house is of wooden stripes creating an entrance canopy and a screen. This is a unique identity we wanted to give it to this house, making it more cozier right from entry. The landscape plays a major part from every corner of the house, at entry also the green is specifically planned to give a very fresh and welcoming ambiance to the house, and amazing panoramic view from the living room is considered by all as the piece of cake. Seating in the large living area we created one long side of fully glazed windows which gives view of greens and sky without any habitat interrupting it. When entering the house you find yourself facing a courtyard which gives a filtered light throughout the house. The metal pillars are so planned to give an uninterrupted view from all these corners. The lower floor has a living room, a family area, an open kitchen, a dinning in corner and a parent’s bedroom. The upper level has four bedrooms , each with its own uniquely designed room and toilets. The staircase connecting the two level is made of metal and wood with minimum supports and also to make it appear floating on artificial green underneath. The top level has terrace , an amazing sky deck is created to seat out at that level. With 360 degree view in a sunset time is an experience ultimate. With greens visible till horizon it makes a perfect place for a evening relaxed chat with family and friends. This entry was posted in bathroom, bedroom, house, kitchen, living, outdoor, terrace and tagged Ahmedabad, bathroom, bedroom, contemporary house, house idea, houseidea, India, kitchen, living, Living In and Out, myhouseidea, outdoor, SAK Designs, terrace, villa on May 1, 2015 by admin.